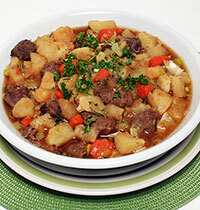 St. Patrick’s Day is a great time to experiment with different Irish staples like root vegetables and lean meat. This stew boasts hearty vegetables like carrots and parsnips, which contain carotenoids, potent antioxidants that help maintain healthy cells. A moderate amount of beef gives the one-pot a full flavor and powerful protein. Give this meal a real cancer-protective punch by pairing it with something green – a fresh salad or some steamed veggies. Bonus points if you eat green while wearing green! Heat oil in large pot over medium-high heat. Add beef and garlic. Cook, gently stirring until meat is evenly browned. Season with salt and pepper. Add onion, carrots and parsnips. Cook for 3 to 4 minutes. Stir in broth and bring to a boil. Reduce heat to low and simmer for about 75 minutes or until meat is tender. Stir in potatoes and simmer another 30 minutes. Add rosemary and leeks. Continue to simmer uncovered until potatoes are tender. Do not overcook to avoid potatoes falling apart. Serve hot and garnish with parsley. Per serving: 370 calories, 8 g total fat (2 g saturated fat), 43 g carbohydrate, 32 g protein, 6 g dietary fiber, 427 mg sodium. The custom of drinking alcohol stems from an Irish legend that St. Patrick chided a dishonest innkeeper for serving his customers less-than-full glasses of whiskey. Although many drink beer to celebrate the occasion, limit to one drink a day for women and 2 for men for lower cancer risk. Copyright © 2019 Ironwood Cancer & Research Centers. All Rights Reserved.